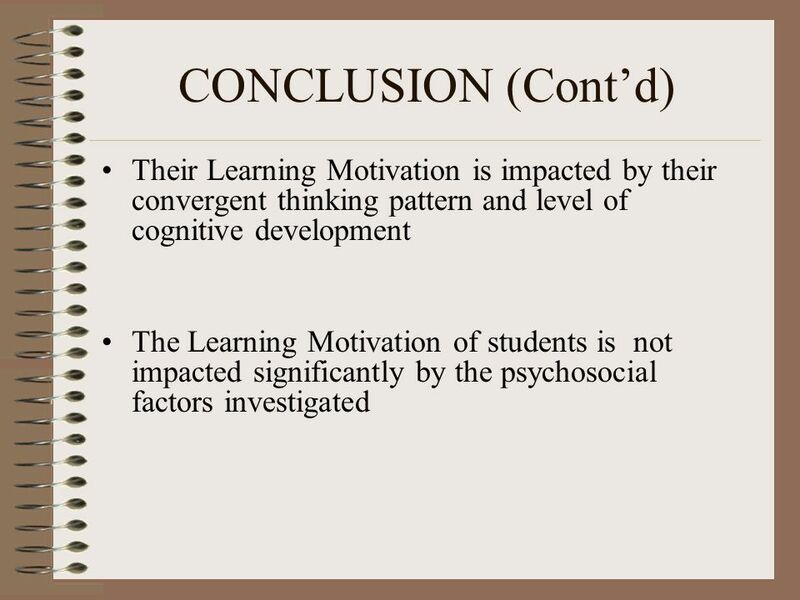 STUDENTS’ PERSPECTIVES ON THE CONCEPTUAL & PSYCHOSOCIAL FACTORS IMPACTING THEIR LEARNING MOTIVATION Presented by : Gaunette Sinclair-Maragh Lecturer University. 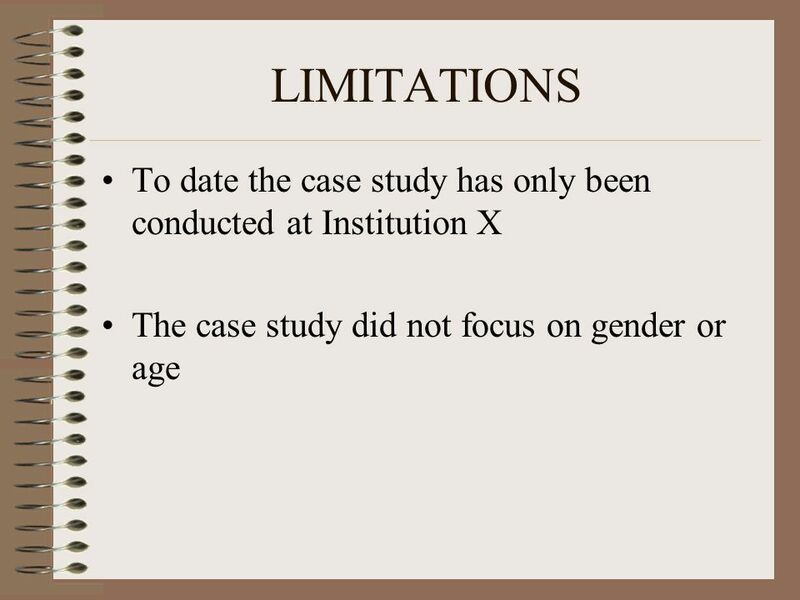 3 BACKGROUND OF CASE STUDY Research was conducted at Institution X to determine whether or not the students’ learning motivation (SLM) was affected by any conceptual and psychosocial factors. 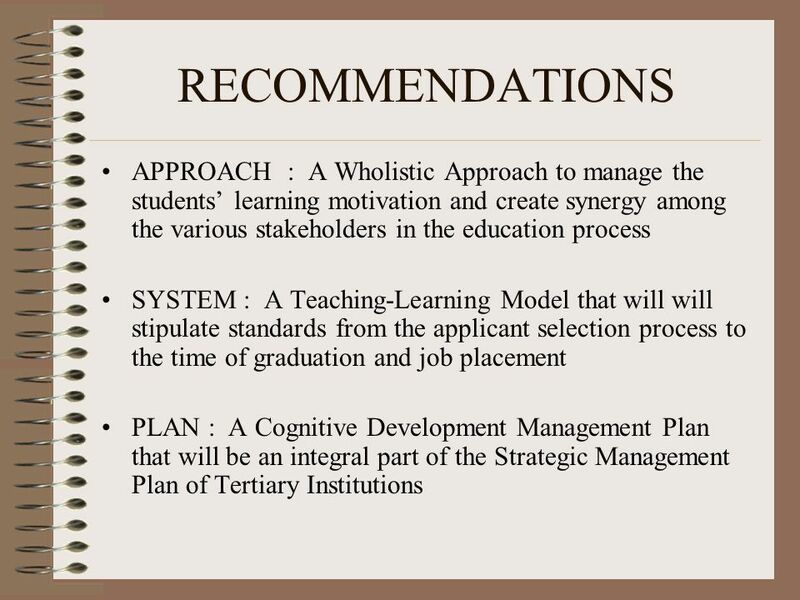 This is the initial phase of a much wider study which will be comparing the factors mentioned above in two or more tertiary institutions offering training in HTM. 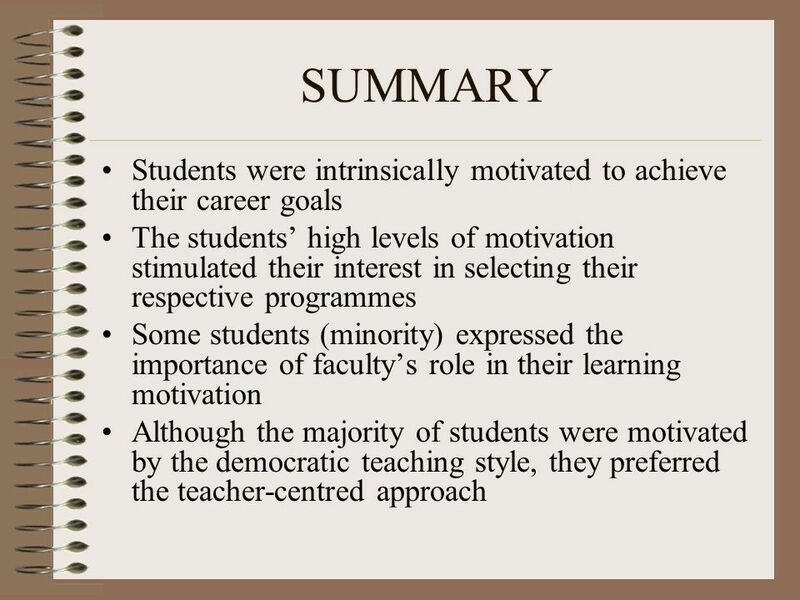 7 RESEARCH QUESTIONS What are the different levels of academic interest and motivation among students at Institution X What is the role of faculty in motivating students to learn? 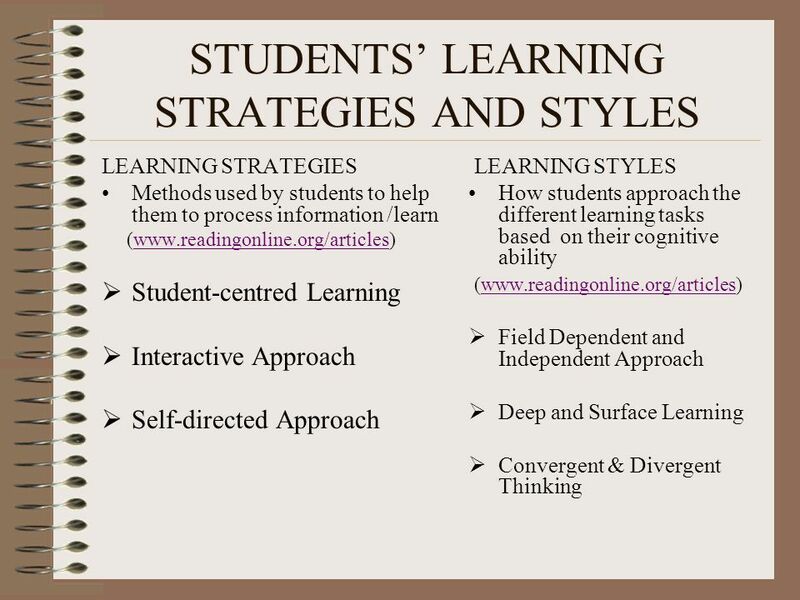 What types of learning strategies and styles are being used by the students? 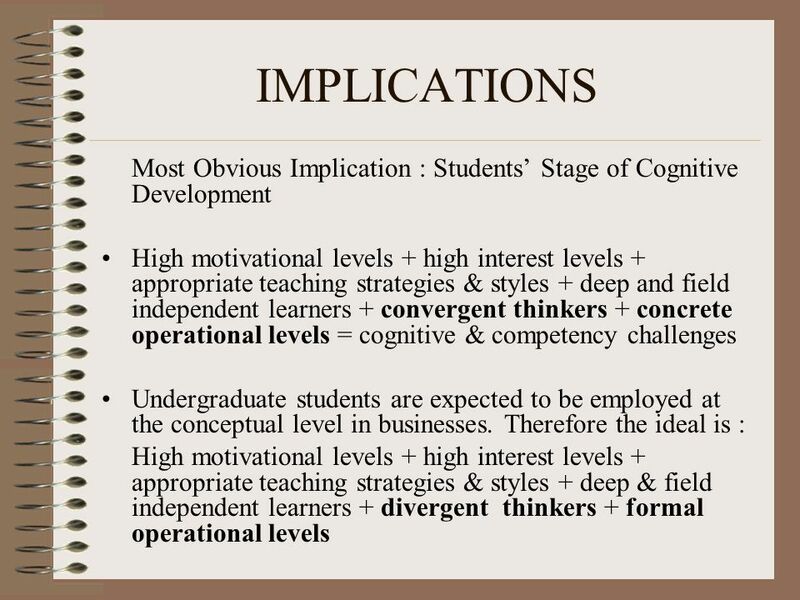 What are the major conceptual challenges confronting the students? 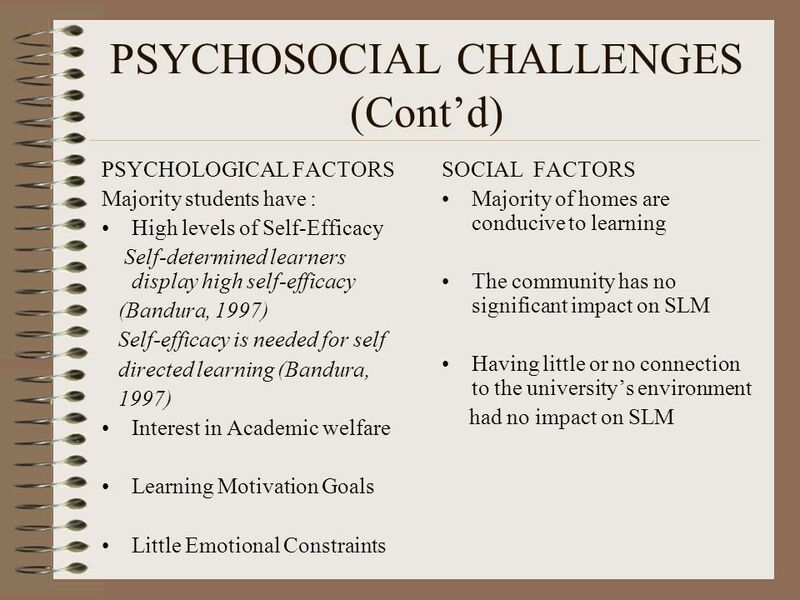 What are the major psychosocial challenges faced by the students? 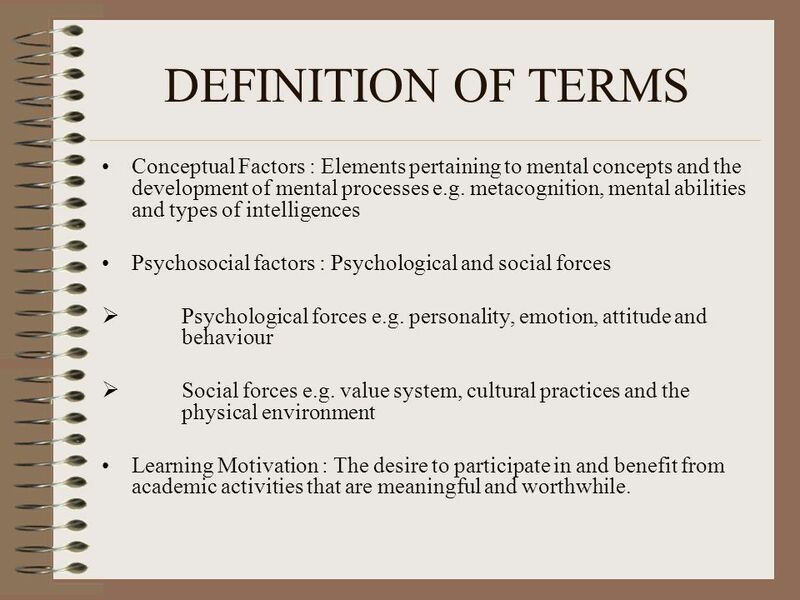 8 DEFINITION OF TERMS Conceptual Factors : Elements pertaining to mental concepts and the development of mental processes e.g. 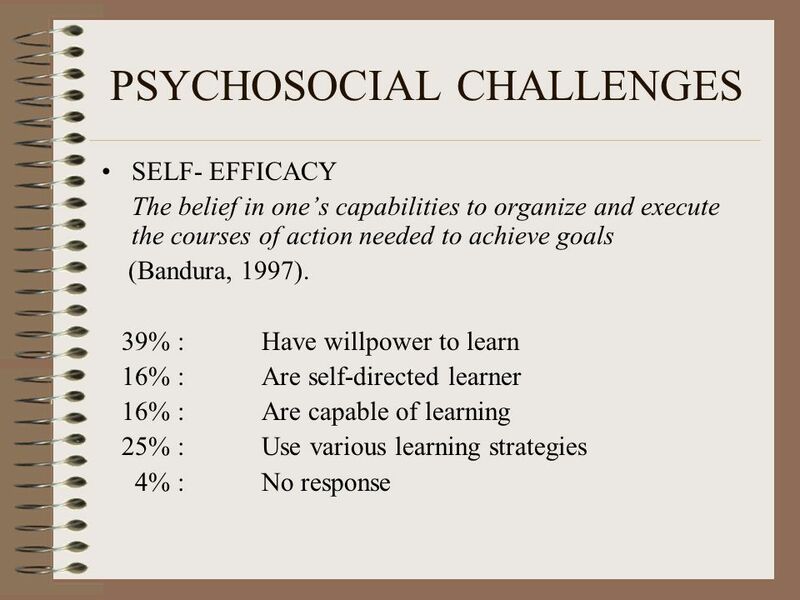 metacognition, mental abilities and types of intelligences Psychosocial factors : Psychological and social forces  Psychological forces e.g. 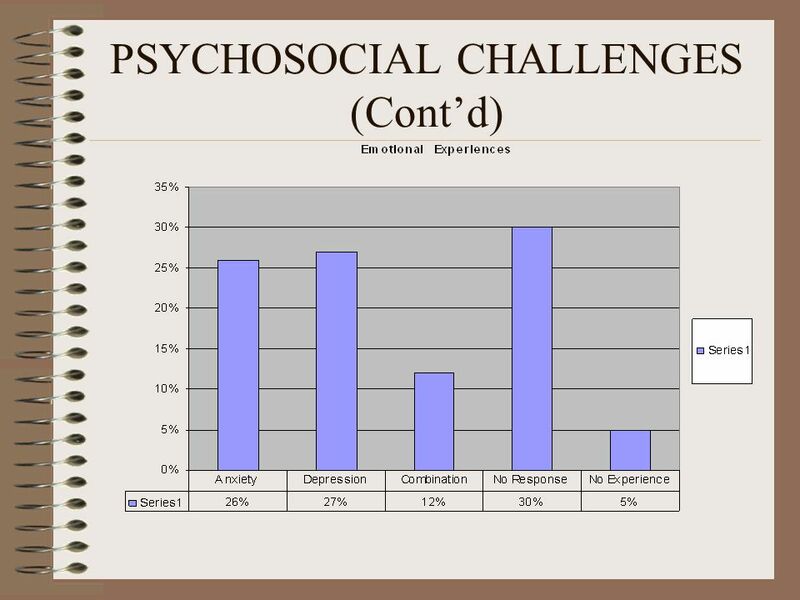 personality, emotion, attitude and behaviour  Social forces e.g. 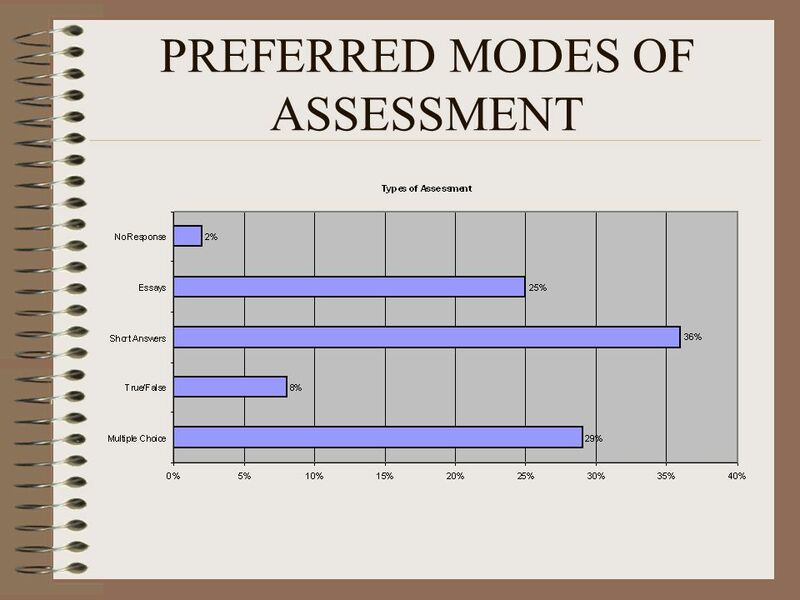 value system, cultural practices and the physical environment Learning Motivation : The desire to participate in and benefit from academic activities that are meaningful and worthwhile. 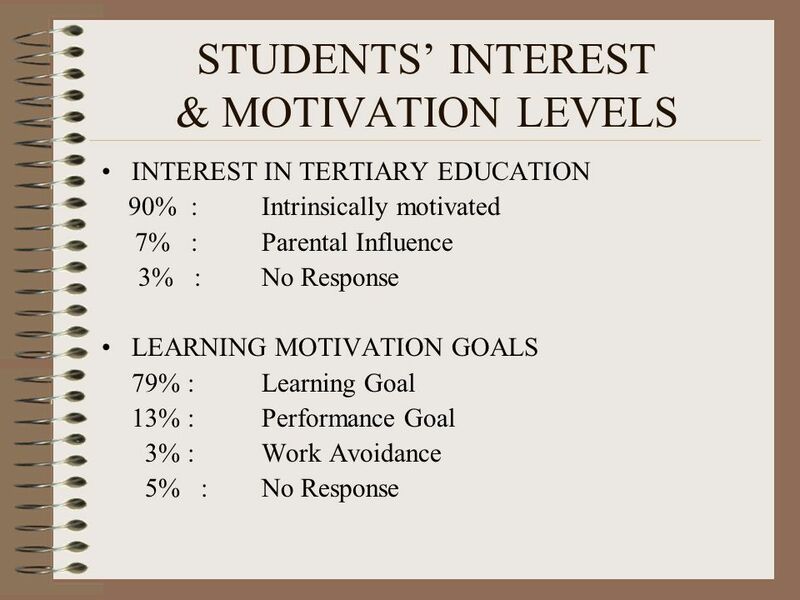 12 RESEARCH OBJECTIVE 1 What are the different levels of academic interests and motivation among students at Institution X? 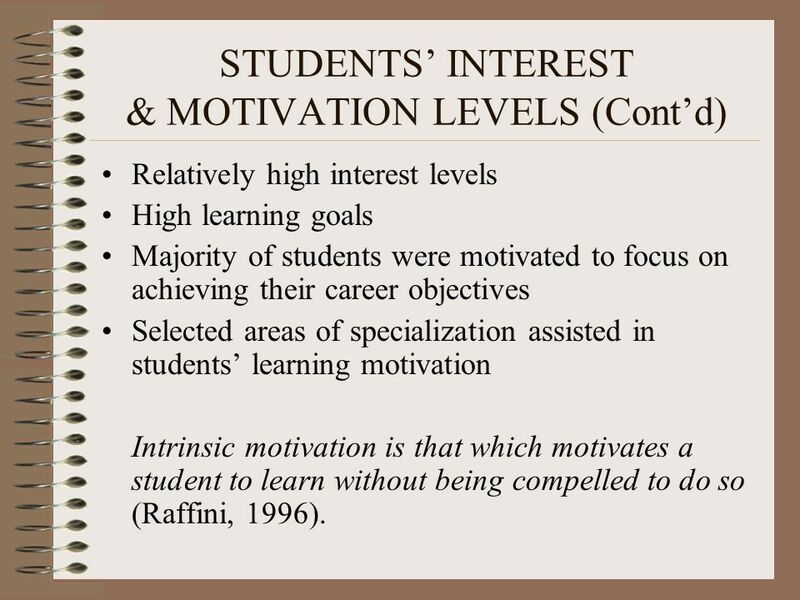 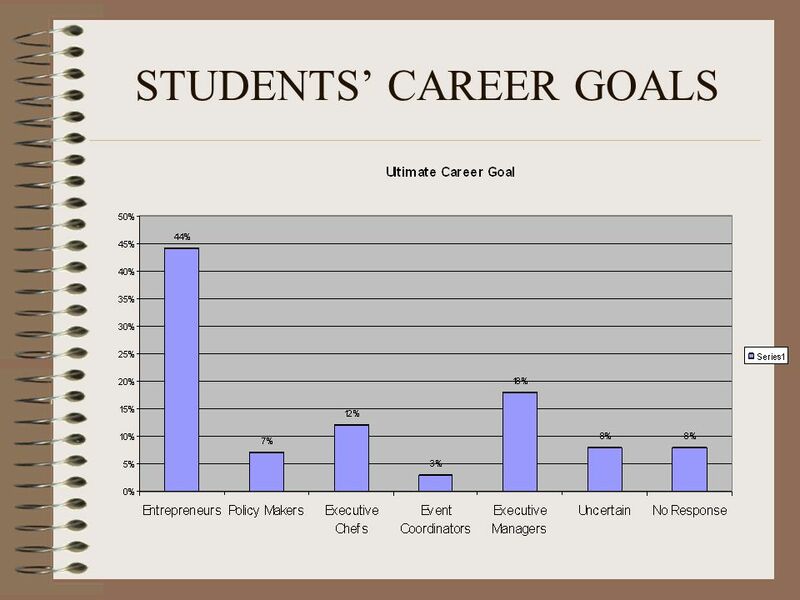 18 STUDENTS’ INTEREST & MOTIVATION LEVELS (Cont’d) Relatively high interest levels High learning goals Majority of students were motivated to focus on achieving their career objectives Selected areas of specialization assisted in students’ learning motivation Intrinsic motivation is that which motivates a student to learn without being compelled to do so (Raffini, 1996). 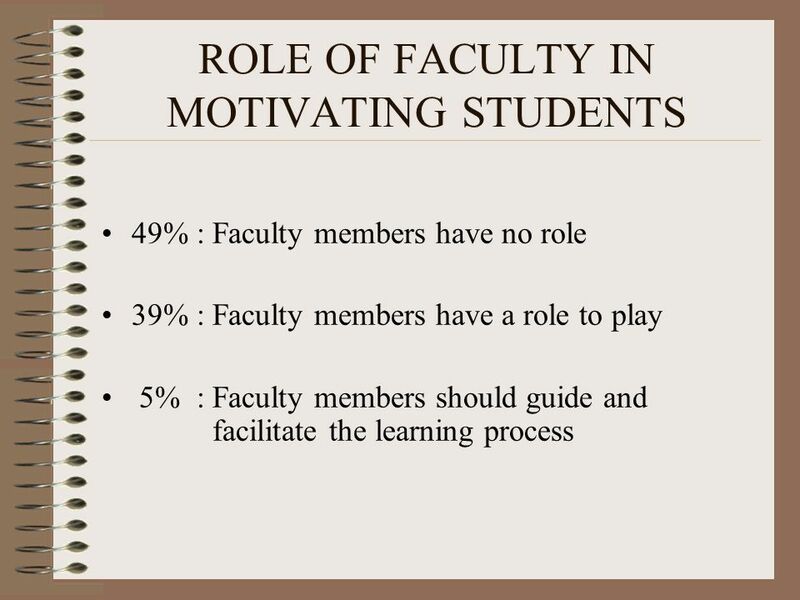 19 RESEARCH OBJECTIVE 2 What is the role of faculty in motivating students to learn? 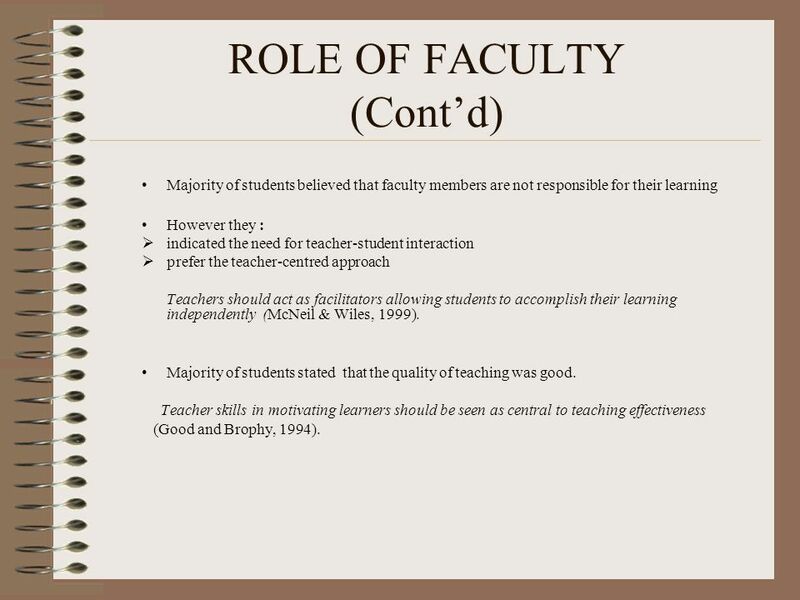 24 ROLE OF FACULTY (Cont’d) Majority of students believed that faculty members are not responsible for their learning However they :  indicated the need for teacher-student interaction  prefer the teacher-centred approach Teachers should act as facilitators allowing students to accomplish their learning independently (McNeil & Wiles, 1999). 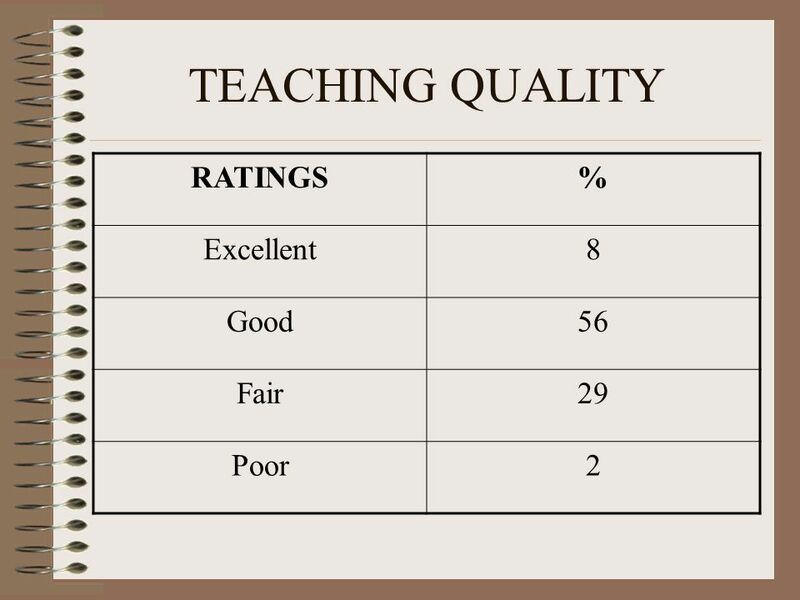 Majority of students stated that the quality of teaching was good. 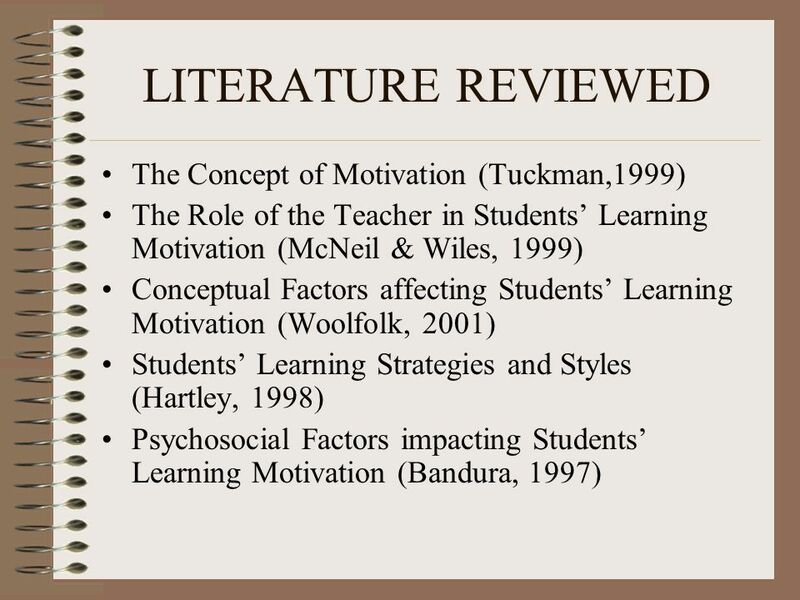 Teacher skills in motivating learners should be seen as central to teaching effectiveness (Good and Brophy, 1994). 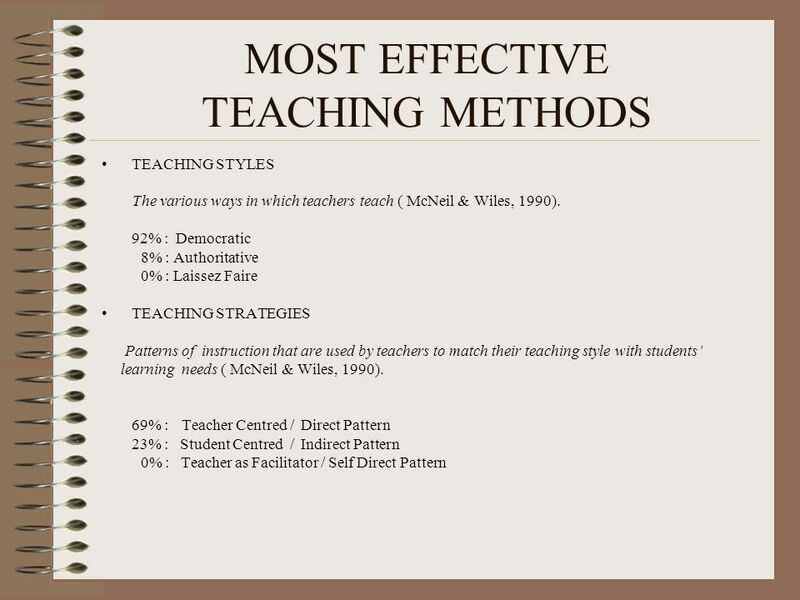 25 RESEARCH OBJECTIVE 3 What types of learning strategies and styles are being used by the students? 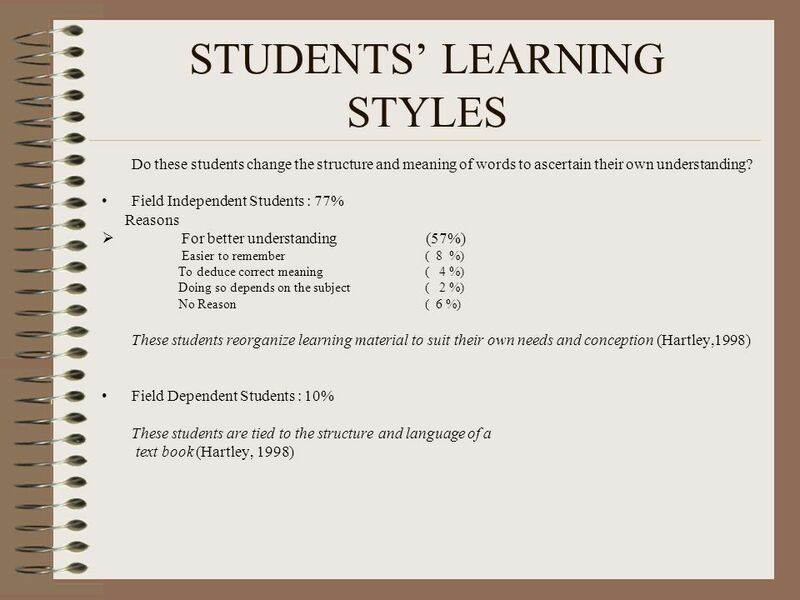 28 STUDENTS’ LEARNING STYLES (Cont’d) Do these students analyze or memorize what they read? 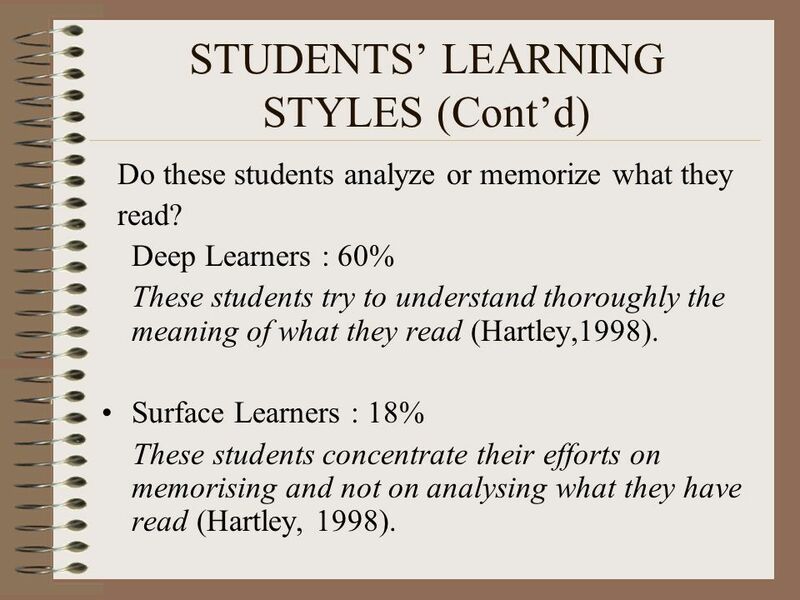 Deep Learners : 60% These students try to understand thoroughly the meaning of what they read (Hartley,1998). 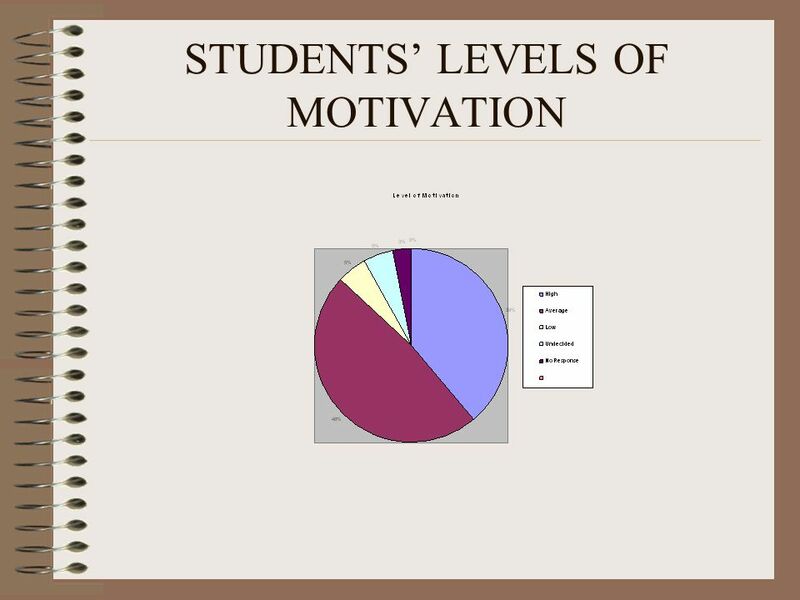 Surface Learners : 18% These students concentrate their efforts on memorising and not on analysing what they have read (Hartley, 1998). 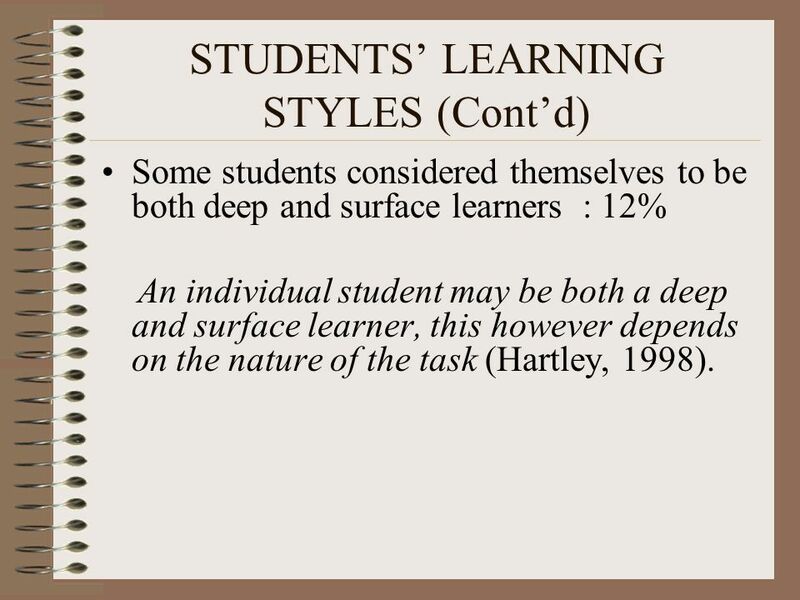 29 STUDENTS’ LEARNING STYLES (Cont’d) Some students considered themselves to be both deep and surface learners : 12% An individual student may be both a deep and surface learner, this however depends on the nature of the task (Hartley, 1998). 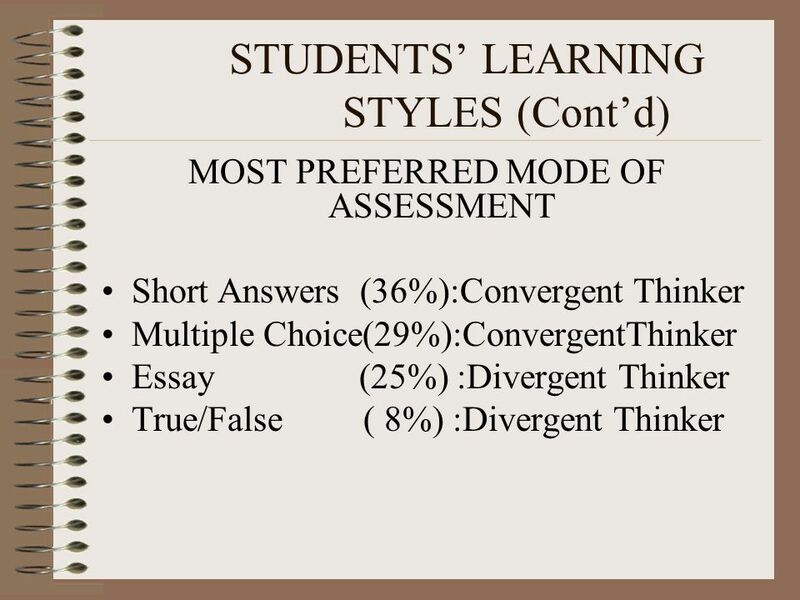 32 STUDENTS’ LEARNING STYLES (Cont’d) CONVERGENT THINKERS These students perform well at tests that require a single answer to the Problem (Hartley,1998). 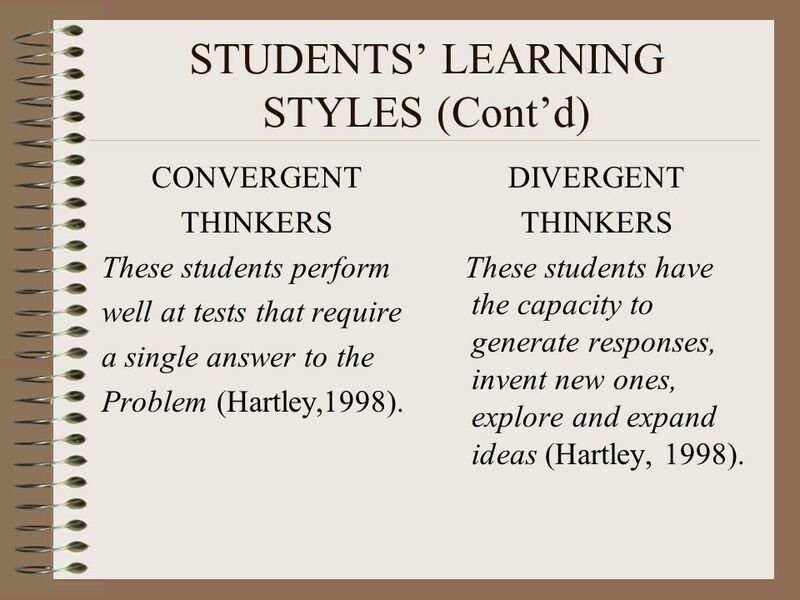 DIVERGENT THINKERS These students have the capacity to generate responses, invent new ones, explore and expand ideas (Hartley, 1998). 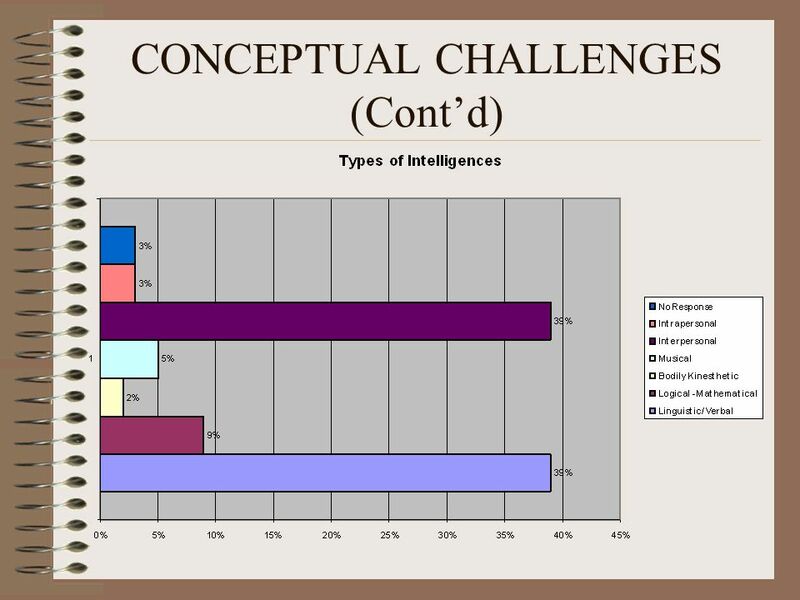 33 RESEARCH OBJECTIVE 4 What are the major conceptual challenges confronting the students? 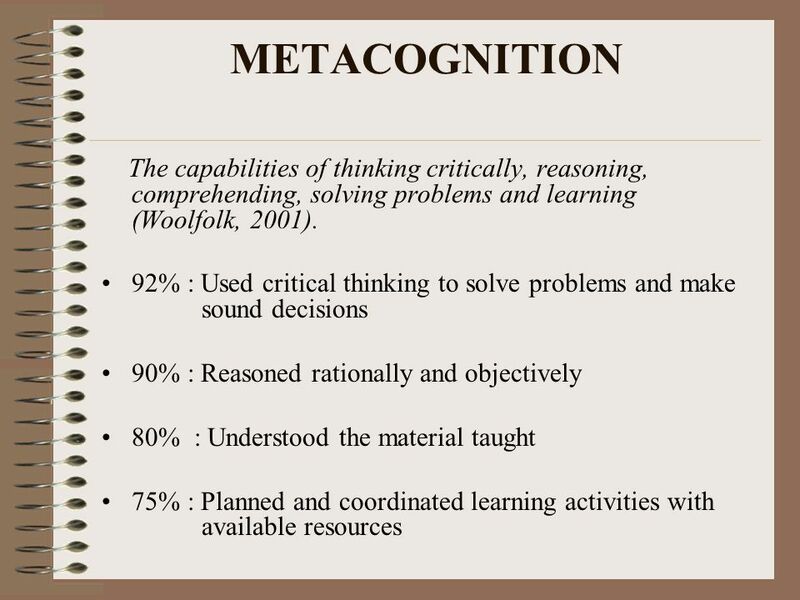 37 CONCEPTUAL CHALLENGES Although the majority of students have metacognitive abilities they were at the concrete operational level This situation frequently occurs among adult learners due to a combination of maturation problems and inappropriate learning environment (Piaget, 1996). 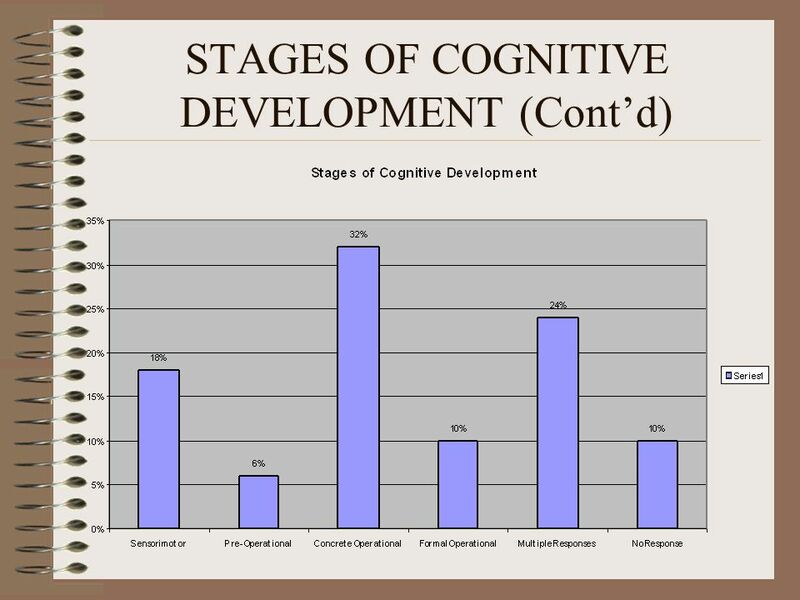 39 Majority of the students have linguistic/verbal and also interpersonal intelligences Persons are endowed with their individual intelligence type which impacts on how and what they learn (Kulieke et al 1990). 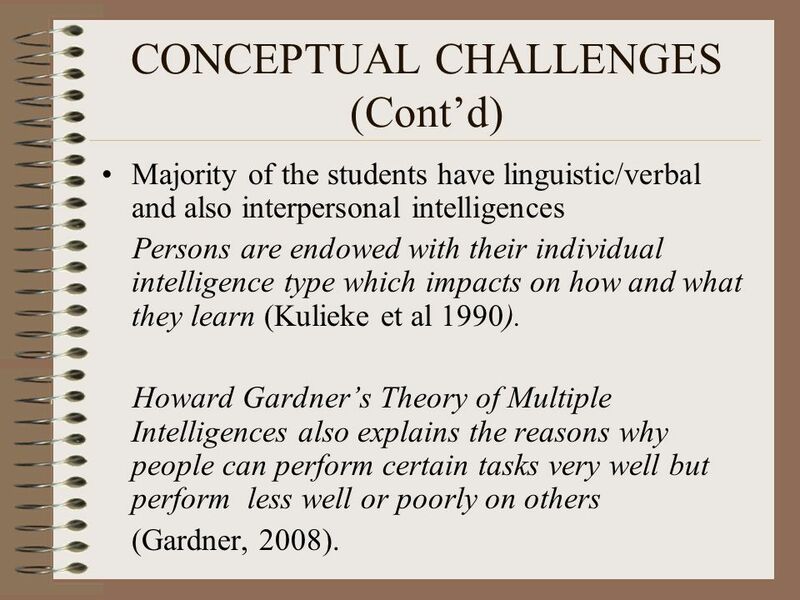 Howard Gardner’s Theory of Multiple Intelligences also explains the reasons why people can perform certain tasks very well but perform less well or poorly on others (Gardner, 2008). 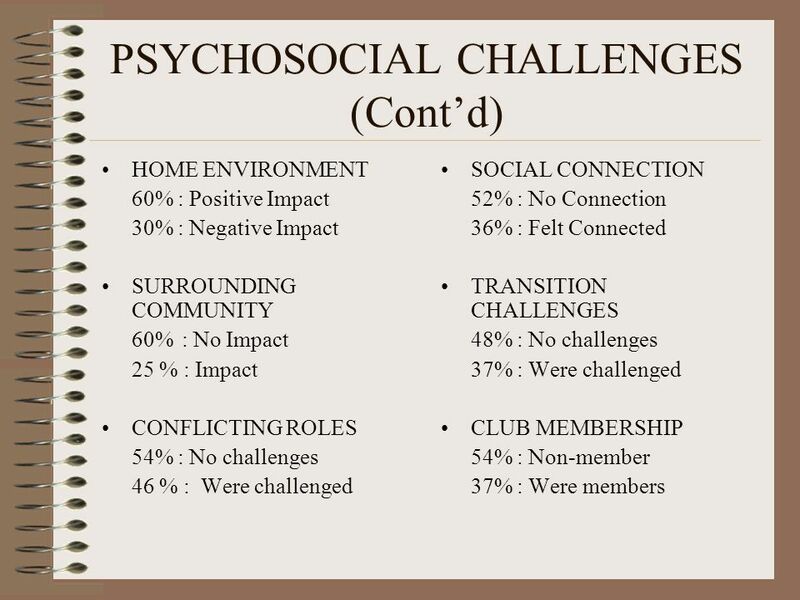 40 RESEARCH OBJECTIVE 5 What are the major psychosocial challenges faced by the students? 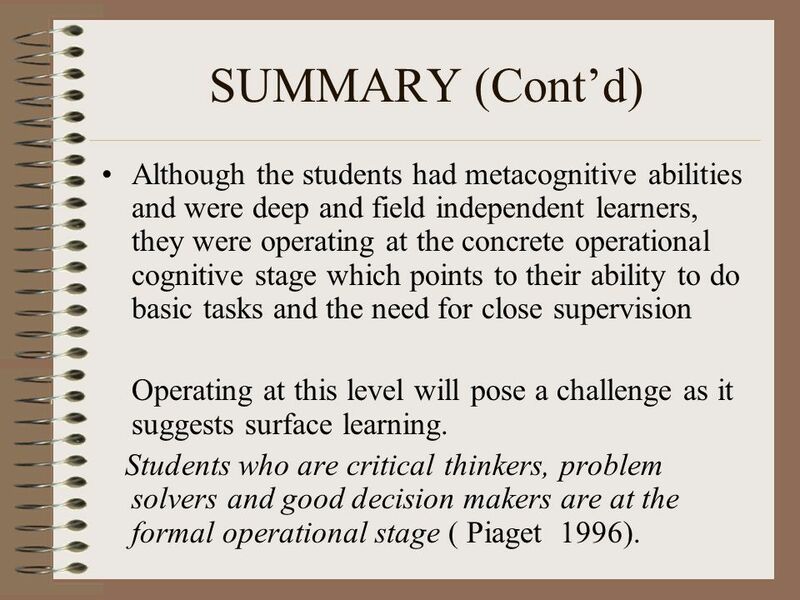 46 SUMMARY (Cont’d) Although the students had metacognitive abilities and were deep and field independent learners, they were operating at the concrete operational cognitive stage which points to their ability to do basic tasks and the need for close supervision Operating at this level will pose a challenge as it suggests surface learning. 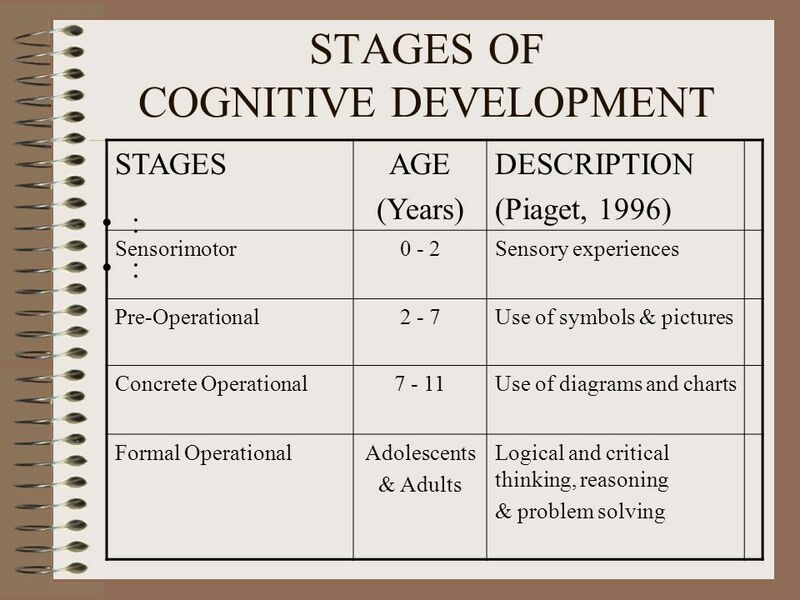 Students who are critical thinkers, problem solvers and good decision makers are at the formal operational stage ( Piaget 1996). 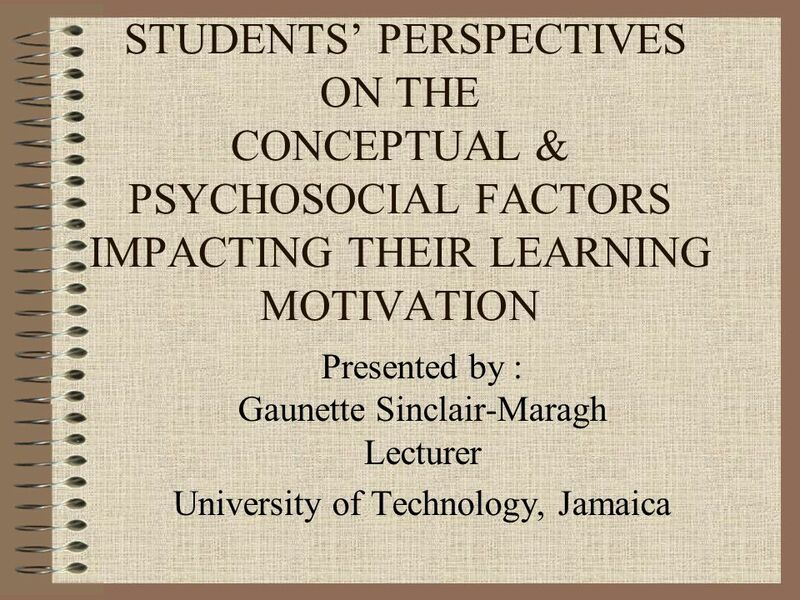 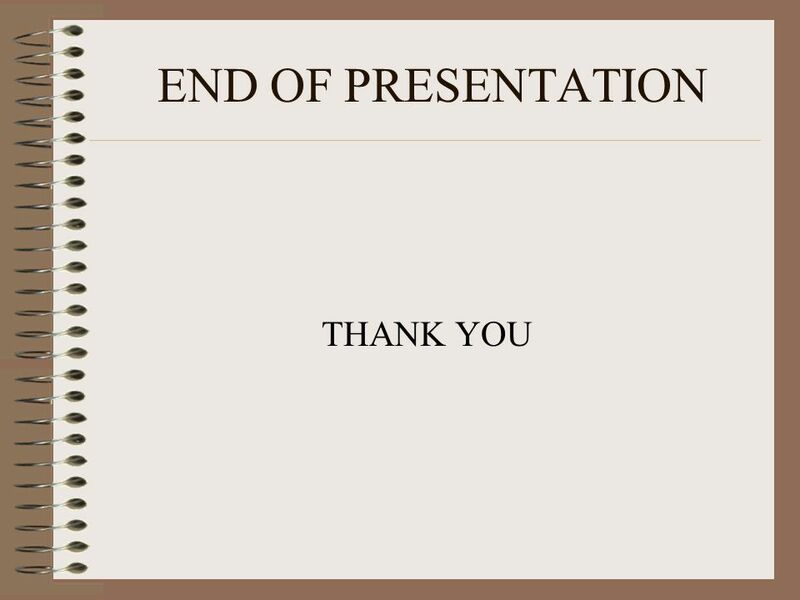 Download ppt "STUDENTS’ PERSPECTIVES ON THE CONCEPTUAL & PSYCHOSOCIAL FACTORS IMPACTING THEIR LEARNING MOTIVATION Presented by : Gaunette Sinclair-Maragh Lecturer University." 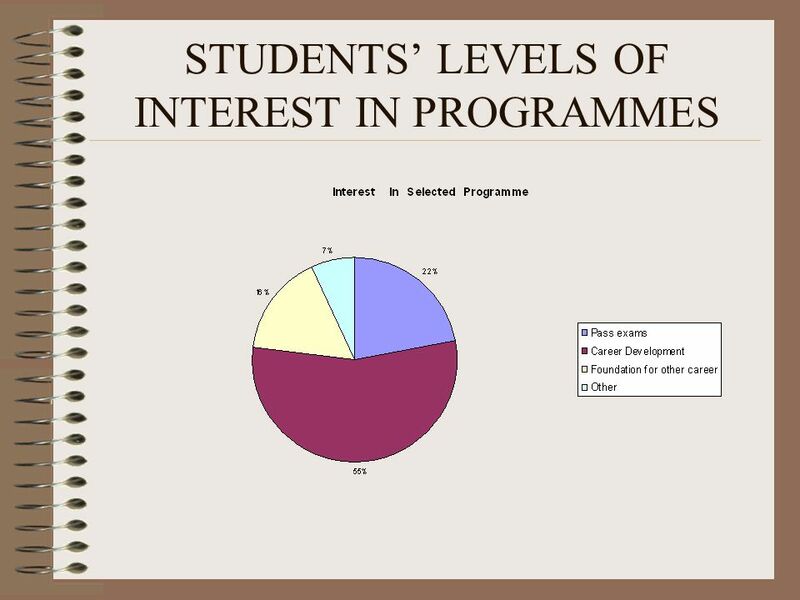 1 Rose in Context The Teaching of Reading in Initial Teacher Education KATHY HALL National University of Ireland, Cork UCET, Sept. 11 th, 2007. 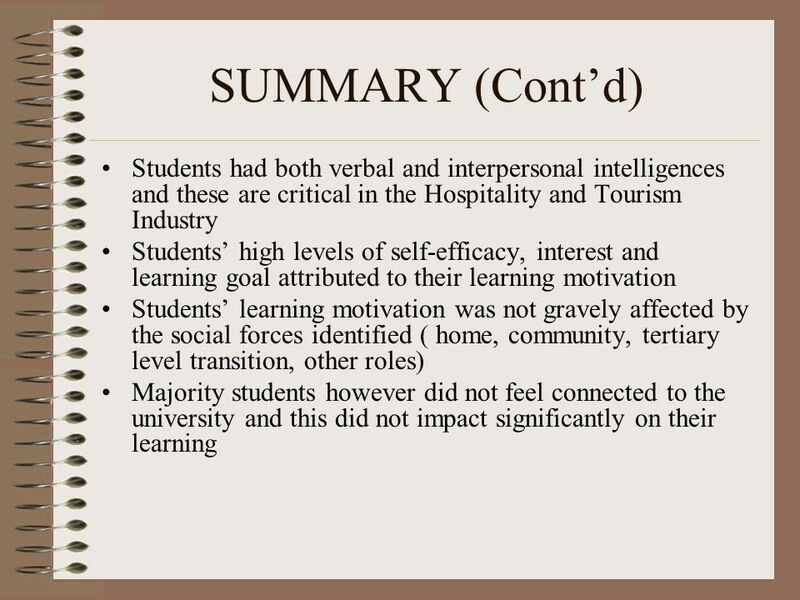 Department of Hospitality, Leisure & Tourism Management Business School The Higher Education Academy Subject Network Pedagogic Research Day March 2005. 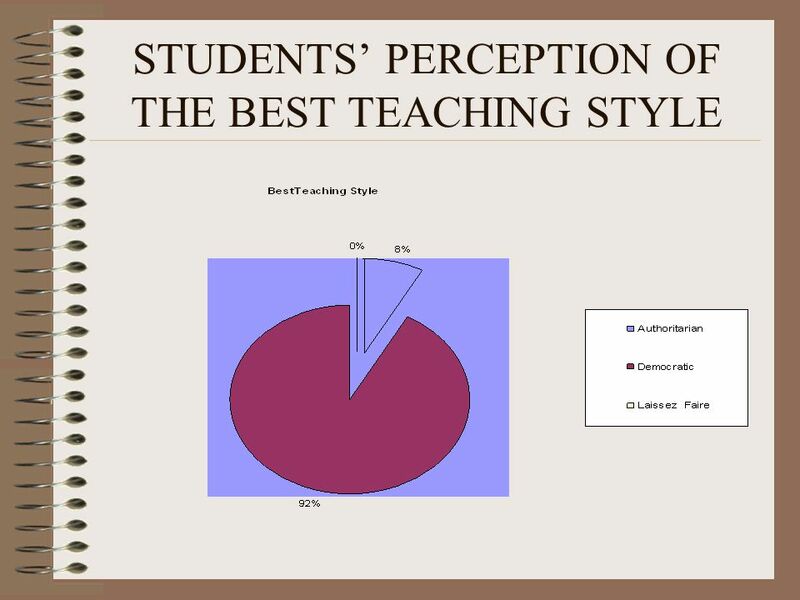 First-Year Teacher Perceptions of Classroom Experiences and Teacher Induction in a Midwestern School District Cheryl Torok Fleming June, 2004. 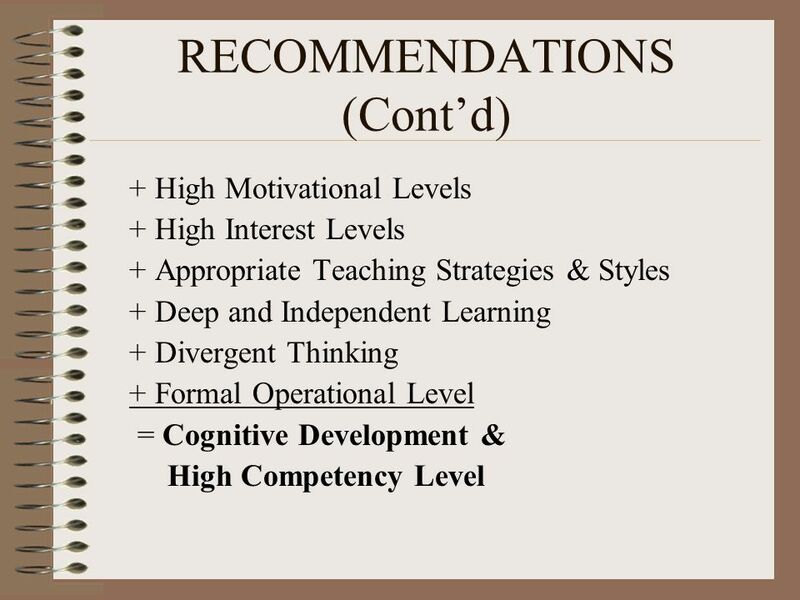 Cognitive-metacognitive and content-technical aspects of constructivist Internet-based learning environments: a LISREL analysis 指導教授：張菽萱 報告人：沈永祺. 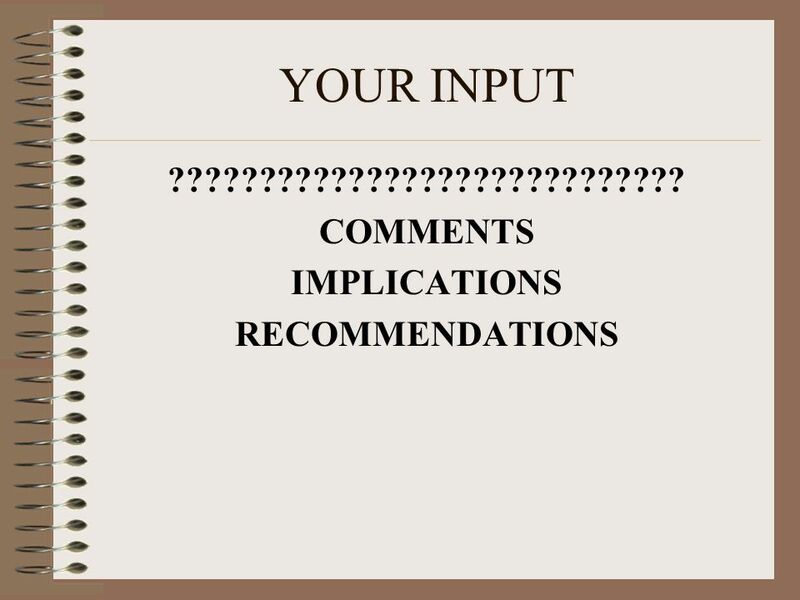 Student Feedback on, and Evaluation of, their Learning Experience Michael Prosser Institute for Teaching and Learning The University of Sydney. 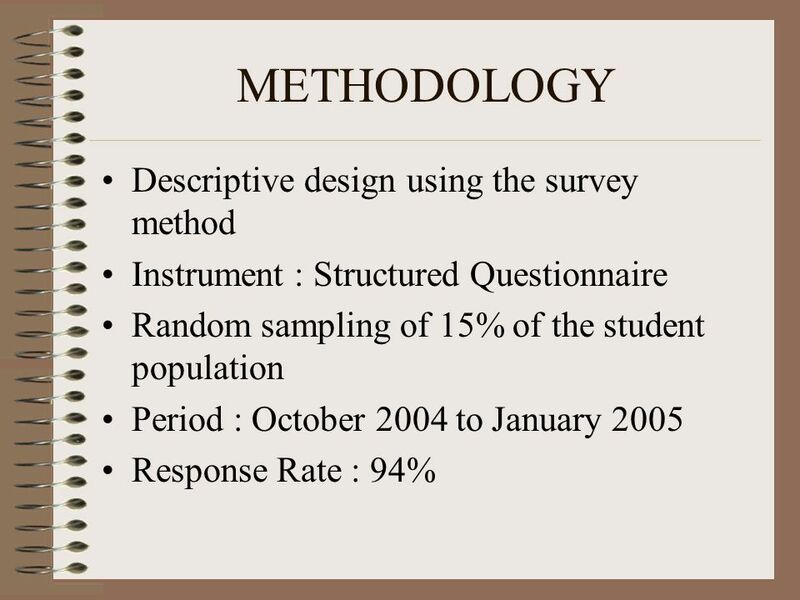 In-Service Physics Teacher Survey Kimberly A. Shaw Southern Illinois University Edwardsville Carl Wenning Illinois State University 14 October 2004. 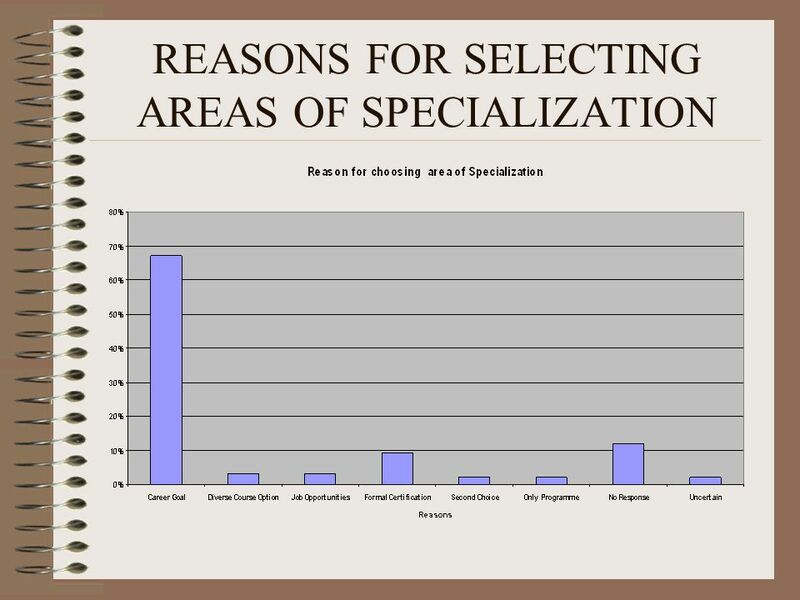 Barriers to Health Service Utilization by Immigrant Families Raising a Child with a Disability Unmet Needs and the Role of Discrimination. 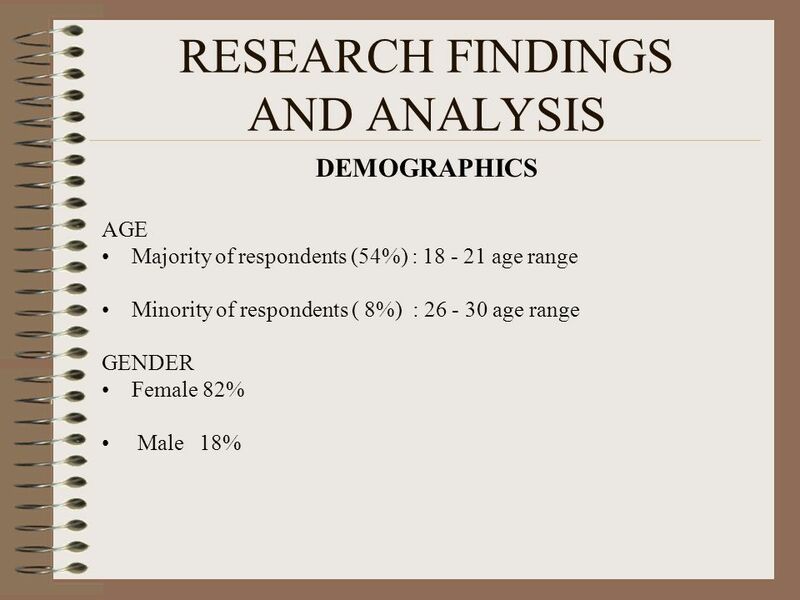 Incorporating Adult Learning Styles Practicum Instructor Training September 17, 2008. 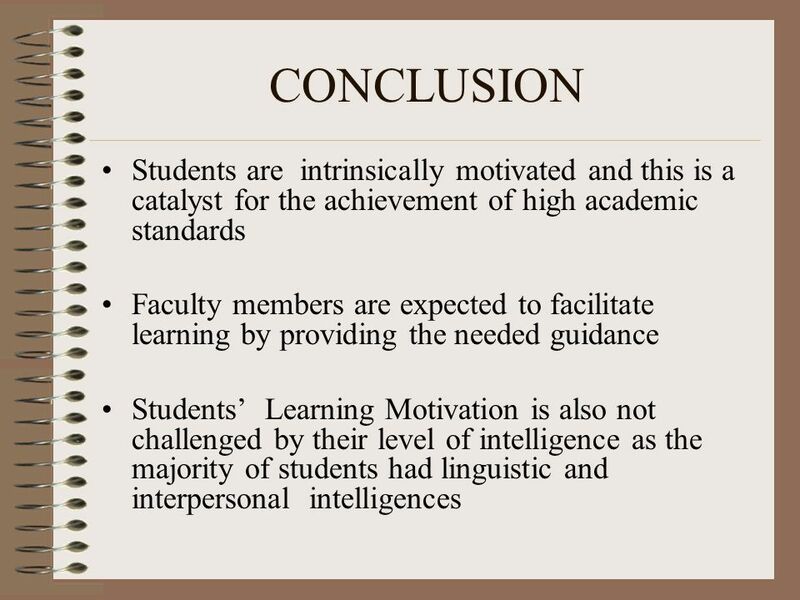 Students’ Autonomy Support in the Context of the English Foundation Program Dr Saleh Al-Busaidi & Dr Victoria Tuzlukova.